The Edmonton Oilers added a veteran body to their blue line on Friday, signing Kris Russell to a one-year, $3.1 million contract. The addition is relatively low-risk, makes sense from an asset management perspective and will bolster the club’s special teams. At the same time, it exacerbates existing problems the Oilers have at even-strength and adds one more left-shooting defenceman to a roster badly overstocked with them. The contract. $3.1 million is a lot of money for what Kris Russell brings to the Oilers, but it doesn’t matter much unless Edmonton had something else to do with that cash. Barring a Jacob Trouba trade, the Oilers really didn’t have anywhere else to spend their remaining cap space, and there is no long-term risk here. So there’s precious little downside even though the dollars here represent an overpay. Asset management. Experienced defencemen always seem to have value at the trade deadline. Just last season the Flames dealt Russell, then a pending UFA, to the Dallas Stars in exchange for a second round pick (which would have increased to a first-rounder if the Stars had gone to the third round of the playoffs), young defender Jyrki Jokipakaa and fringe prospect Brett Pollock. If, as seems likely, the Oilers’ playoff absence extends for yet another campaign, Edmonton should be able to get some kind of trade return on the last few months of Russell’s one-year deal. Special teams. Russell is known for his work on special teams. He averaged just under 2:00 per game on Calgary’s penalty kill last season and will certainly reprise that role in Edmonton. He also ranks 42nd among NHL defenceman over the last three seasons in terms of 5-on-4 points/hour, which puts him all of two spots ahead of Andrej Sekera. He is arguably now the best power play defenceman on the Oilers, though he remains best-suited to a second unit role. Even strength. It’s fair to ask to what degree Russell’s five-on-five problems stem from being asked to do too much with the Flames. Prior to joining Calgary, he played primarily in a sheltered third-pairing role and had really solid on-ice shot metrics. After joining Calgary he played tougher opponents and spent more time in the defensive zone. Over a three-year period the Flames were out-shot by 14 attempts per hour when he was on the ice, and every single one of his regular defensive partners had significantly better numbers when paired with someone else. It takes a lot to turn Mark Giordano into a 44% Corsi defenceman and TJ Brodie into a 43% Corsi defenceman, but Russell managed – helped no doubt by the fact that those pairings were both lefty/lefty pairs. Left-shooting defencemen. There’s a good chance that five of Edmonton’s six starting defenceman in Game 1 shoot left (Russell, Oscar Klefbom, Andrej Sekera, Brandon Davidson, Darnell Nurse). This matters a lot. Peter Chiarelli specifically described defencemen playing their correct side of the ice as a “very significant” reason for acquiring Adam Larsson. Sekera, a veteran who has played a ton of minutes on his off-side and will likely be asked to do so again this year, really suffers when asked to switch. As we detailed this summer, there’s a five-shot attempt/hour decline for his team when he plays on his wrong side. That’s a little less than the impact on most defencemen, which a recent study found is usually in the range of 6-7 shot attempts per hour. Assuming that the top-six is as above, two of Edmonton’s three pairings are going to be lefty/lefty combinations, which is going to make it harder to both protect the puck, make routine passes and especially to launch the attack out of the defensive zone. It’s hard to come down hard on this signing, which is both low-risk and makes sense from an asset management perspective. But it’s almost equally hard to say that the $3.1 million spent on Russell makes the Oilers any likelier to reach the postseason than they were before his signing. Russell could really have excelled in a third-pair/special teams role with a right-shooting partner, and Edmonton doesn’t seem to have the luxury of putting him in a position where he can succeed. After a long summer of arguing and waiting, the NHL season is right around the corner and that means it’s time for us to throw another party. 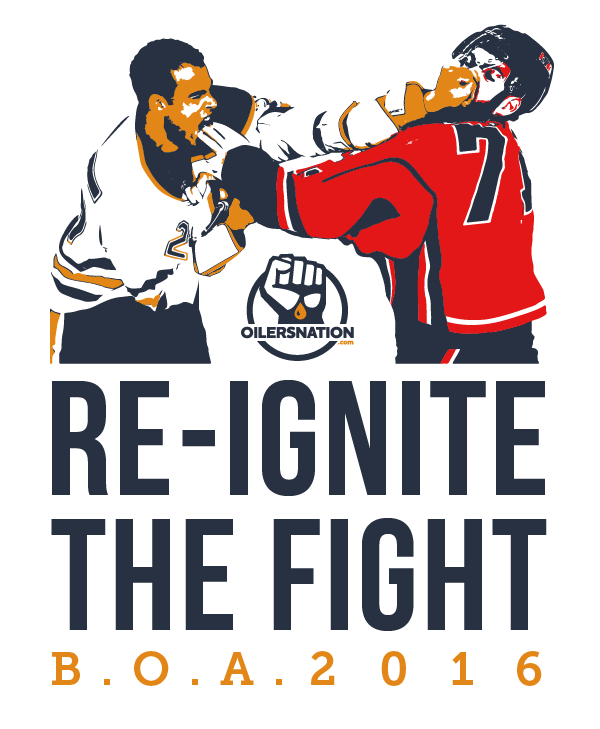 We wanted a second take on last year’s season and decided that we would celebrate the start of the second year of Connor’s reign over Oil Country. Thanks to our friends at AMA Travel, Cornerstone Insurance, the Pint, Oodle Noodle, and United Cycle we’ve got a big night planned for you complete with raffles, swag bags, and two trips (valued at $5000 each) for two to the outdoor game in Winnipeg courtesy of AMA Travel. Your comments may be okay, except about the beautiful new rink. You obviously have not sat in the spacious upper bowl seating. Kris Russell is far better than the analytics people would have you believe. Wait till you see him play. He’s a great skater and will get the puck up the ice to the Oil’s excellent forwards. The one thing not calculable are his intangibles: good in the dressing room, brave on the ice. He will sacrifice himself for the team, and even fight guys much larger if the situation arises. Most analytics people will tell you his shot-blocking is a negative, but I will tell you there aren’t many character guys who will jump in front of blasts like he will. As well, hockey people who lift their heads from the stat sheets and watch play, talk to players, management and coaches, all like Russell as a player including Chia obviously. The only thing I find curious is the amount the Oil paid for a D-man presumably out of work less than a week prior to the regular season. Sounds like Ference from 4-5 years back. What scares me is him playing good and then getting signed to a 4-5 year deal. I agree! The worst thing that could happen is for a player to play well. Wait, what? Yak is back in two weeks? Do they do a commemorative video on the jumbotron welcoming him and thanking him for being an Oiler? I remember when it was a big deal that KLowe gave permission for Hall to wear his “iconic” #4. Today it’s no big deal that Russell will wear it. Says something about the recent declined value of the stock of both KLowe and Hall. Wow this is a move that will haunt us for a very long time we turned a first overall pick to a conditional 3rd rounder and picked up the one player that would guarantee us the worst off season in the NHL. I’m sorry I could even forgive Peter for Reinhart but this asset management will probably cost us the playoffs and hopefully Peter’s job, we do have a new whipping boy and his name is Peter. Come on Russel? What was Peter thinking he can basically block shots that’s it which means we are in our end so he is good when we are bad and are bad because of him. Fire Peter before he ruins this team we will now be out of the playoffs for 11 years and this one is on Peter. Two first overall picks are gone and we have Russel and Larsson (who could be good) to show for it. Peter just doesn’t know talent or appreciate it. I don’t really see how Russel is a bad move. One year deals are generally low risk. They have the cap space, more defensive depth now. High profile dmen aren’t exactly being moved around for peanuts or sitting unsigned waiting for a contract. Its not like they gift him top line minutes in all situations. He’s a good skater, posses a decent shot and has the ability to get shots through on the PP. Kris Russell’s goto defensive coverage. Puck lost at or near the blueline, Russell can either engage and opposing player and attempt to take the puck or drop back. Russell always drops back, allowing the player free and unfettered OZone time to pass or shoot. If the puck carrier tries to get a shot off, Russell wil drop down and generally effectively blocks the shot. His challenges are numerous. If the player fakes and passes, fakes and dekes, or is able to get the round back, he’s rarely able to adequately cover, leaving his defensive partner alone and out numbered. It’s this tendency that (I’ll speak for myself) drives my nuts. Bob Hartley is not his coach and shotblocking is not McLelan’s primary defensive scheme. I can actually see Russell’s goto move take away from him, and belive me it should be. The question is can a diminutive defender adequately tie guys up and take plays away, instead of dropping back. So let me get this straight yak was never going to get a chance in the top 6 baring in mind an injury. If the only guy he could play with was Mcdavid ( and I’ll admit anyone could do that) than what value does he have rotting on the third line. Versteeg is a much experienced and consistent option. As for Russell, why are people complaining. Calgary put him in a position where he couldn’t succeed much like we have done with Schultz, nurse and yak. He is a special team guy, pk, heavy pp and sheltered third line minutes. If he isn’t asked to play outside his comfort range it could be a perfect fit. This could also mean nurse gets sent down for seasoning which could be beneficial to the kid. He needs to learn how to play top minutes in the ahl, and have a better IQ sense, kid has the body but he was out of position a lot last year. last week, right here at Oilers nation, i predicted Russell signing this week at 3+ million, and received a lot of hate and thumbs down. ya, he has a down side, but lots of upside, and is better than anyone you have to play in the 4,5,6,7 spot that isn’t named Russell. it’s one year, it buys some time… it’s a good move for an organization that NEEDS to move up the depth chart and get out of last place. I don’t know about you guys, but if we didn’t win the McLottery, my metal would be seriously tested right now. This blue and orange stuff is like crack though. (a) Bring another “true” NHL’er to our D-Core something we lacked a lot of last year. (b) Like Lucic, Maroon, Kassian, brings in another guy that plays with heart – this time by blocking shots and sacrificing himself. Would I rather have Rasmus Ristolainen out of Buffalo that is a young mobile right handed D-man with offensive flare. Sure! But there is a huge price to pay for that TODAY. I don’t doubt that Nurse or Davidson will get traded this season at some point. PC is just waiting for teams to get a bit more desperate so that he doesn’t haven’t to pay a King’s Ransom. Grinding assets into dust is part of the decade long failure portfolio. The good news is that Chia is a man of action when it comes to having a fire sale for those withered assets. The bad news is, the guys who did the grinding to dust are still right there and Pete is not very good. To be fair, the team is fresh and ready to make it’s own mark under McCaptain and start the climb out of misery. Sure his last season was only 19Pts in a shortened season in which he was traded, but this is a journeyman NHL defender who is widely accepted as a valuable piece to any blue line. Given that, $3.1mill for one year on a UFA is actually a great signing by Chiarelli. It’s rare not to have to overpay in term and in money when signing veteran UFA’s, and in this case, the Oilers didn’t have to do either. If things work out well, he’s only 29 and could be nice value added offence that we could use from the backend going forward. If not, it’s a one year deal. 3.1 million for Russell and people still think Lowe and Mac-T don’t have Chia’s ear. What do they need with another LHD They better trade one for a RHD soon or this makes them even more dysfunctional. The more I trhink about the Russel acquisition the more convinced I become that Nusre starts the year in the AHL. RD will be Larssen, Sekera, Fayne. Sekera played the entire WCOH on the right side. 7the Dman might be Gryba or maybe a waiver pick up. Nurse and Benning both better served playing minutes in the AHL than as 7th Dman in the [ress box. McLellan has already said that Russell will play the right side and Sekera will stay on the left. Makes sense if they picked up a RHD and not overpay yet another LHD. PS: Davidson is already much better than Russell. I agree. But it’s only for one year. Experience is important with defensemen. Russell will take some pressure off of Nurse. The dollar value is a bit high for the minutes he will play but the trade off is that it is only a one year show me deal. Having a motivated veteran defender who can log the ugly minutes should translate to more wins. Not a bad idea to have spare parts kicking around on the blue line even if they are LH. No reason to believe that the injury problems that have plagued the Oil for a decade are going to disappear anytime soon. Might as well just plan for a steady stream of blue back and forth from IR. Besides, Oil don’t have anything else to spend their $$$’s at the moment. One year deal means no implications for the future and maybe even an extra pick at the deadline if the season goes sideways again. Anywho, good to see Chia’s seems able to sign players. Maybe the Lames should ask him for advice on how to get players signed…. Whenever Willis writes about a bad signing, remember – he hated the Hendricks deal too……….